As a key summit on the future of Afghanistan starts in London, a shift in emphasis towards protecting civilians has seen British troops employ a new strategy dubbed "courageous restraint". British troops from the 4th Battalion the Rifles come under fire in one of the most dangerous parts of Helmand province. 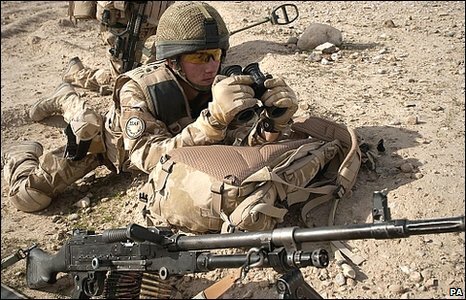 One of their snipers is poised to take a shot at the Afghan who appears to be pointing out their exact position to the insurgents, a possible "dicker". But the sniper holds fire. The man might just be a civilian caught up in the middle. So, instead, the British soldier aims a shot close by, not to kill or wound but to warn. The man and the insurgents disappear. The threat was enough. That story is cited by British commanders in Helmand as just one recent example of "courageous restraint". Gen Stanley McChrystal, the overall commander in Afghanistan, has ordered this to be one of the central tenets of the current counter-insurgency strategy: Putting protecting civilians at the heart of the military operation. 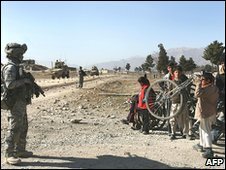 Commanders are all too aware that military force alone cannot defeat the Taliban but that getting it wrong on the battlefield - and killing or injuring Afghan civilians, or damaging their homes and crop - can help fuel the insurgency. This new restraint means dropping fewer bombs, using fewer munitions and - when fighting - using more brain-power than fire-power. The British unit in Helmand put together specifically for counter-insurgency - 11 Light Brigade - is trying to put that doctrine into practice on the ground, in some of the most heavily-populated areas of the province. Use of high-explosive artillery shells by British troops is down more than 60%, while the use of smoke shells to mask movement is up nearly 70%. Nato forces around the country are now focused above all on winning over the Afghan people to the side of their government. According to a recent UN report, the Taliban are now responsible for some 78% of civilian casualties. "It takes training and discipline not to fire back if you are fired upon," says Lt Col David Wakefield, the Task Force Helmand spokesman. "The natural thing for soldiers is to give heaps back if they come under fire, but now we look to manoeuvre instead if we can, because it is crucial not to jeopardise a single civilian life." The current strategy may depend on protecting population centres, as well as building up the Afghan national army and police to take over security, but it still involves striking at Taliban safe havens. Operations aimed against the Taliban are being heralded in advance to villagers, to explain why they are taking place. Maj Gen Nick Carter, who commands the British troops in southern Afghanistan, says recent experience of Canadian troops and the Grenadier Guards has shown better progress was made when talks were held first with local people. Maj Gen Carter is aware that the counter-insurgency campaign in Afghanistan needs to show "positive trends" quickly, as public support in the UK and many other Nato troop-contributing countries wavers. He is clear that there are signs of progress. Poppy cultivation in Helmand is down by a third, although that could be down to a drop in opium prices. A subsidised wheat seed programme has reached 40,000 farmers in the province, giving them an alternative to poppy crops. Some district centres are now under Afghan army and police control, with shops and bazaars re-opening, even in areas such as Sangin. At the same time, according to British and US trainers, the recent pay rise for the Afghan Army and police means their salary compares favourably with Taliban pay rates and has helped recruitment. These are all cited as clear glimmers of hope, even though nobody would deny that progress is still fragile. Corruption remains one of the Afghans' biggest complaints, with a report from the UN Office on Drugs and Crime revealing that half the Afghan population had paid a bribe to a public official over the course of the year. Meanwhile, almost 60% of Afghans thought government corruption was a bigger problem than insecurity. In some areas of Helmand, in particular, it is acknowledged that the Taliban are managing to out-govern the official government, for example by providing rapid and summary justice to local disputes. "Much of Helmand is ungoverned at the moment," admits Maj Gen Carter. "If we are going to win the argument, we have to assert our control, especially in central Helmand, where 750,000 people live. "It all comes back to [the counter-insurgency doctrine of] 'clear, hold and build'. Things are evolving and the Afghans are standing up and being counted." Ultimately, military commanders - and the extra 30,000 US troops plus others from Nato - know they are just one crucial part of a wider whole. That needs to work coherently if Afghanistan is to become stable enough to withdraw most foreign troops within three to five years, as the US, UK and other Nato countries would like. Much of that progress will depend on the Afghan government and which side the Afghan people ultimately believe will win.